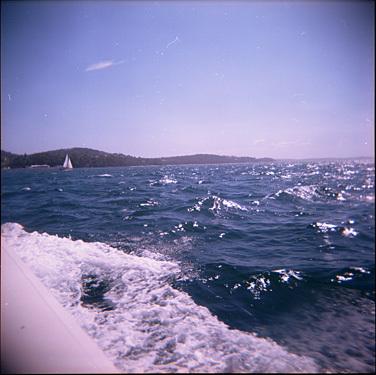 This is from my first roll from my Holga. It was from an afteronoon dolphin watching at Port Stephens. This entry (permalink) was posted on Wednesday, October 25th, 2006 at 10:48 AM by John Cassimatis and categorized in Holga 120. Hey dude. Awesome photo blog you have here. I especially like the hay bales. Very picturesque. You do realise, however, that this is johncassimatis.com, not johnsrandomphotos.com, so you should have a little bit more about you in here. Anyway my one question is, what’s a holga?? Thanks for posting the Holga images. I’ve been thinking about buying a Holga, so I appreciate the examples. Your images are nice and sharp, and they seem to have a vintage quality about them. Cheers.